List Of Expressways in Haryana – (हरियाणा के एक्सप्रेसवे की सूचि) : Haryana state in North India has vast network of Roads. Here is the list of Expressways in Haryana. 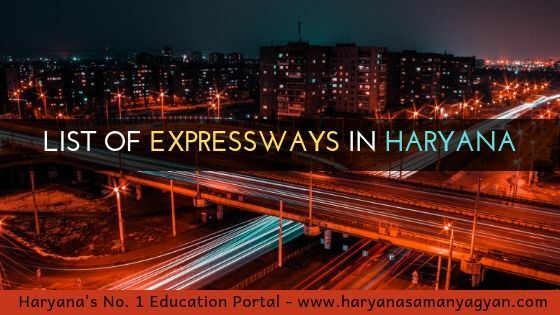 Following expressways, also called e-ways, pass through Haryana. Delhi Faridabad Skyway 6 Operational 4.4 NH-19, Elevated. Future extension to Dhuaj-WPE-Punhana. Delhi Mumbai Expressway 12 Under construction 1209 Construction from Dec 2018, projected completion by Dec 2021. Hisar Delhi Expressway 6 Planned 170 Greenfield straight-line alignment to Gurugram-Delhi. Hisar – Kanwari – Gujrani – Chhuchakwas – Farrukh Nagar – KMP Expressway – IGI Airport (Dwarka Experssway). Additional spur from Palwal KMPE to Jewar Airport, this will connect Hisar Airport to IGI and Jewar. Outer Western Peripheral Expressway 6 Proposed 500 Not yet approved. Meerut-Samalkha – Gohana – Meham – Matanhail – Kosli – Bhadas – Hodal – Jewar – Yamuna Expressway. NCR Counter Magnet Cities Peripheral Expressway 6 Proposed 2000 Greenfield alignment. Not yet approved. Hisar – Ambala (incl. Patiala) – Dhradun (from Ambala via Yamuna Nagar) – Bareilly – Kanpur – Bhopal – Kota – Jaipur – Hisar.